As with most aspects of our bodies, we get the best results from eating a well-balanced, vitamin rich diet. Vitamin deficiencies show up quickly as weakened, brittle fingernails or pits in the nail. 2. Keep your nails trimmed. If you’ve ever had long nails, then you’ve almost certainly suffered from a broken nail at some point. Broken nails are painful! They’re also bothersome, and we find that we pick at ours and make them worse. The only solution we’ve found to broken nails is to actually prevent them by keeping nails well-trimmed. You know the length your nails can withstand; there’s no need to grow them out longer just to suffer the inevitable painful break while you’re trying to wash the dishes. While your fingernails themselves may not need moisture, your fingertips and cuticles absolutely do. The cuticle is a naturally tough piece of skin, but it is prone to cracking and drying out painfully when it isn’t kept well moisturised. Oh, and while we’re on the subject of cuticles, make sure you never cut them. Your cuticles are a living part of your body, and trimming them will only invite infection. 4. Clean your nails with baking soda. Regular hand washing is great for keeping the surface of your nails clean, but they will need some extra attention to get them clean and white underneath. The best way to clean them is to dip a wet toothbrush into baking soda and scrub under each nail. You can also add a few drops of lemon juice or peroxide if you need the extra whitening power. 5. File your nails the right way. When we think of nail files, we picture teenage girls from movies going back and forth over their fingernails while chatting with their friends. Turns out the girls in the movies don’t usually file their nails correctly, though. For one, they probably use a typical emory board with too much grit. Rough nail files do more harm than good to fingernails, and should be replaced with very fine nail files. Also, nails should only be filed in one direction, as sawing back and forth weakens the nail. Buffing is the process of polishing your fingernails until they shine. Looking at my nails right now, I can see they are a little dull and not particularly smooth. That’s their natural state, and it usually works just fine for me. However, if you want a more professional or smooth look, using a nail buffer is worth a try. Use caution, though, because too much buffing undermines the natural strength of your nail. Try not to use many household chemicals for cleaning. That’s great for you and great for your nails. If you haven’t completely kicked that habit, though, you really should consider wearing gloves for protection. Household chemicals can weaken and stain your nails with consistent use. 8. Skip the harmful chemicals. Speaking of chemicals, there are many associated with traditional nail care. Most nail polish itself is full of them, but it’s not nearly as destructive to your nails as the acetone that many nail polish removers contain. Acetone dries out skin, nails, and cuticles. Non-acetone polish removers are not quite as harmful as acetone, but they do still have a drying effect and contain a myriad of chemicals. 9. Know when to leave your nails alone. While upkeep and care for your nails are important, sometimes it’s best to leave them alone. Biting your nails, picking at them (I’ve already admitted that I’m guilty of that one, oops! ), pulling at hangnails – all of those things will lead to painful problems. 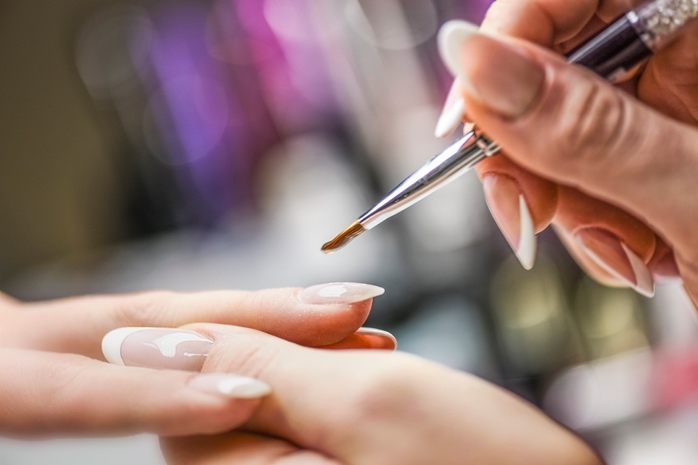 At The Works in Marple we pride ourselves on providing an outstanding manicure and pedicure service and will always give advice when it comes to keeping your nails tip top. It’s FAR easier to maintain healthy nails than to repair them when they are damaged.